The medieval walled Spanish city of Ávila is capital of the province of Castile and Leon. 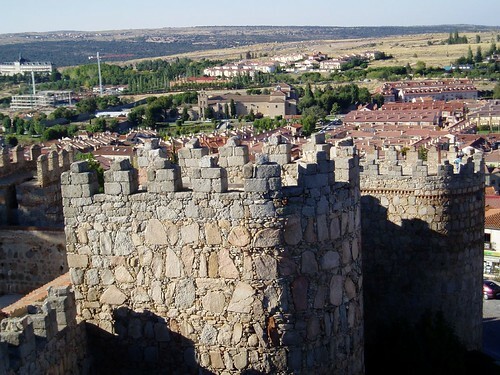 It’s also known as “Avila de los Caballeros”, “Ávila de los Leales”, “Ávila del Rey” and city of “Pebbles and Saints”. Avila’s Romanesque style walls and ramparts, with many churches of both Romanesque and Gothic styles make it one of the most typical 12-16th century Spanish cities. The 15th century Catholic monarchs summer residence Monastery of Santo Tomás, the churches of San Vicente and San Pedro and the 12-15th century Cathedral and its fortifications are all most imposing, beautifully restored and well maintained. The 12-14th century Basílica de San Vicente by the Plaza de Santa Teresa with its atrium, towers, crypt, naves, dome, Latin cross plan and apses is but full of precious religious art. The pretty hermitage (Ermita) de San Segundo on the bank of the Adaja river, just outside the city walls and to the west of Avila, features an interesting alabaster statue that’s supposed to make your wish come true. The Santuario de Nuestra Señora de Sonsoles is in a picturesque and tranquil location about 6 km from Avila; the nearby playgrounds, picnic spots and restaurant make this a nice choice for a short visit. An excellent choice of museums includes the Museums of Avila, of Oriental Art, Natural Sciences, Living Water and la Encarnación. The Hall of Torreón de los Guzmanes is an old palace, while Guido Caprotti Museum, displaying works of the Italian painter who lived in the city in the early 20th century, is due to open again soon after renovation. Local fiestas/holidays include the festivities of Santa Teresa, lasting during almost the whole of October features musical performances, bullfights and liturgical performances. The festival’s grand procession is between Santa Teresa Church and the Cathedral. For some local dishes, choose between the rare-grilled Chuletón de Avila T-bone steak, the Barco de Avila white beans with chorizo and the traditional sweet pastry Yemas de Santa Teresa.